For the former Brooklyn–Manhattan Transit Corporation 5 service, see Culver Shuttle. The 5 Lexington Avenue Express is a rapid transit service in the A Division of the New York City Subway. Its route emblem, or "bullet", is colored apple green since it uses the IRT Lexington Avenue Line in Manhattan. The 5 operates at all times. Weekday rush hour and midday service operates between Dyre Avenue in Eastchester, Bronx and Flatbush Avenue–Brooklyn College in Midwood, Brooklyn, making local stops in the Bronx and express stops in Manhattan and Brooklyn; during rush hours in the peak direction, 5 trains operate express in the Bronx between East 180th Street and Third Avenue–149th Street; limited rush hour service originates and terminates at Nereid Avenue[a] or 241st Street[b] in the Bronx instead of Dyre Avenue, as well as either at Utica[c] or New Lots Avenues[d] in Brooklyn instead of Flatbush Avenue. The 5 short turns at Bowling Green in Financial District, Manhattan during weekday evenings and weekends, and operates as a shuttle between Dyre Avenue and East 180th Street during late nights. Historically, 5 trains have run to Crown Heights–Utica Avenue or New Lots Avenue. Since 1983, most trains run only to Bowling Green or Flatbush Avenue, although some rush-hour trains still run to Utica or New Lots Avenues. Peak service on White Plains Road was cut from 241st Street to 238th Street. During weekends in 2017 and 2018, service ran between 241st Street and Flatbush Avenue to replace 2 service. 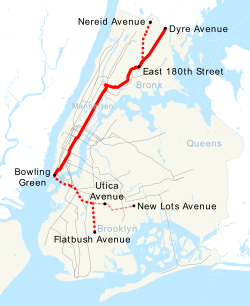 The section from East 180th Street to Dyre Avenue was once part of the mainline of the New York, Westchester and Boston Railway, a standard gauge electric commuter railroad built by the New York, New Haven and Hartford Railroad. Upon its closure in 1937, the entire property was put up for sale. On December 21, 1925, the number of Manhattan-bound through trains in the morning rush hour, from the White Plains Road Line was doubled with the addition of two more through trips, and service was considerably increase in the evening rush hour toward the Bronx, with through trains running every 11 minutes. Rush hour service was designated with a diamond bullet until May 27, 2005. Beginning on April 28, 1930, Saturday 5 service to Crown Heights–Utica Avenue began. As of 1934, trains normally ran from Wakefield–241st Street or East 180th Street to Atlantic Avenue–Barclays Center. During weekday rush hours and weekend afternoons they were extended to Utica Avenue. Late-night service was not operated. From July 24, 1938, to September 18, 1938, there was Sunday daytime 5 service to New Lots Avenue. Beginning on July 10, 1939, Sunday afternoon 5 service to New Lots began. On December 22, 1946, alternate Sunday morning 5 service to New Lots began. However, on March 5, 1950, 5 service was cut back to Utica Avenue all day on Sundays. Express service on the IRT White Plains Road Line began on April 23, 1953 with alternate 5 trains using the middle track between East 180th Street and 149th Street during the weekday rush in the peak direction. Starting on October 2, 1953, 5 Thru-Expreses began running express between East 180th Street and Gun Hill Road using the middle track in order to encourage passengers who changed at Gun Hill Road for Third Avenue Elevated service to stay on subway trains. From June 7, 1954 to June 16, 1958, they skipped 138th Street. On June 16, 1958, these 5 trains resumed stopping at 138th, with 4 trains skipping the station during rush hours. Beginning on May 3, 1957, limited rush hour 5 service ran to Flatbush Avenue–Brooklyn College replacing the 4 service. Evening, Saturday afternoon, and Sunday trains were cut back to South Ferry. Beginning on March 1, 1960, evening trains began making all stops in Manhattan. Beginning on April 8, 1960, weekday evening service was discontinued, as was weekday rush service to Flatbush Avenue. This was a brochure given out to passengers by the New York City Transit Authority in anticipation of the April 18, 1965 changes in IRT service. Starting on April 18, 1965, most daytime service was rerouted to Dyre Avenue, replacing 2 daytime service to Dyre Avenue except evenings and late nights when shuttle service served Dyre Avenue. Some weekday rush peak-direction service to 241st Street was retained, while Saturday and Sunday evening trains were cut back from 241st Street to East 180th Street. Also, Saturday morning trains were cut back from Atlantic Avenue to South Ferry. Starting on May 3, 1965, trains to or from 241st Street began making all stops between Gun Hill Road and East 180th Street. Beginning on May 23, 1976, 5 service began starting late on Sunday mornings. As of May 24, 1976, weekday midday 5 service was cut back to Bowling Green from Atlantic Avenue. In 1979, with the color coding of subway routes based on their trunk line in Manhattan, the 5 service's color was changed to apple green, as it goes via the Lexington Avenue Line in Manhattan. On January 13, 1980, all 5 service to/from Dyre Avenue and Wakefield–241st Street during rush hours in the peak direction began running express in the Bronx. 5 service was re-extended May 15, 1980, to Atlantic Avenue. On July 10, 1983, all rush hour service ran to Flatbush Avenue, with limited service to/from Utica or New Lots Avenue. Beginning on January 18, 1988, all midday 5 service was cut back to Bowling Green, to allow 4 service to operate to Utica. In Spring 1995, rush hour service to 241st Street was cut back to Nereid Avenue. 241st Street had insufficient capacity to terminate all 2 and 5 trains during rush hours, requiring some 2 and 5 trips to terminate at Nereid Avenue. To ease passenger confusion regarding which trips terminate where and to provide more reliable service, it was decided to have all 2 trips terminate at 241st Street and have all 5 trains terminate at 238th Street. In addition, the span of 5 peak period Bronx express service to Dyre Avenue was expanded by 45 minutes in each rush hour. These two recommendations were made in response to comments made as party of the Northeast Bronx Comprehensive Study. New York City Transit decided against operating all 5 trains via the Dyre Avenue Line because it would reduce the attractiveness of the White Plains Road Line as it would force passengers using the Lexington Avenue Line to transfer. However, this would have simplified operations. On May 27, 2005, use of the 5 diamond to indicate peak direction service to Nereid Avenue was discontinued. On June 29, 2009, 5 trains were extended to Flatbush Avenue during midday hours. From March 29 to September 3, 2010, rush hour peak direction 5 express service was suspended due to rehabilitation of East 180th Street and signal replacements along the IRT White Plains Road Line. PM northbound express service was suspended again on March 28, 2011, to allow for the second phase of the signal replacement project. This time, service was restored on August 8. Due to repairs to Hurricane Sandy-related damage in the Clark Street Tunnel, which carries the IRT Broadway–Seventh Avenue Line into Brooklyn, between June 17, 2017 and June 23, 2018, the 5 was extended to Flatbush Avenue on weekends, running local in Brooklyn. In the Bronx, the 5 ran to 241st Street instead of Dyre Avenue in place of the 2. In 1940, the City of New York purchased the New York, Westchester and Boston Railway, and began integrating the line into the system. The railroad north of the city line to White Plains and Port Chester was quickly dismantled. The section below East 180th Street to Greens Farm Junction was once used to interchange with the New Haven (and later Penn Central and Conrail) to bring subway cars and other equipment on and off the system. That section has since been removed, isolating this part of the subway from the interchange. The East 180th Street–Dyre Avenue Shuttle or Dyre Avenue Shuttle was established as a new subway service and full-time shuttle along this section on May 15, 1941, between the former East 180th Street station of the New York, Westchester and Boston Railway and Eastchester–Dyre Avenue, which was the northernmost station on the NYW&B within New York City. Passengers had to make a walking transfer between the Dyre Avenue Line and the IRT White Plains Road Line at East 180th Street as there was no track connection between the lines. In 1957, a flyover connection opened between the East 180th Street station of the White Plains Road Line and the Dyre Avenue Line, enabling through service by trains from the 2 route from Manhattan to Dyre Avenue. At the same time, the former NYW&B station was closed and the off-hours Dyre Avenue Shuttle rerouted to the White Plains Road Line station. These shuttles were initially labeled 2 like the full-time service but were later signed as 9, a number used decades when skip-stop service on the IRT Broadway–Seventh Avenue Line was instituted and split between the 1 and 9 services. The off-hours Dyre Avenue Shuttle still operates, but those trains are signed as 5, the same as the through service. Gun Hill Road/Seymour Avenue Eastchester-bound trains will not stop at this station due to renovations until September 2019. Flatbush Avenue-bound trains will not stop at this station due to renovations until July 2019. ^ Limited rush hour service to Manhattan and Brooklyn originates at Nereid Avenue during a.m. rush hours; service from Brooklyn and Manhattan terminates at Nereid Avenue during p.m. rush hours. ^ Limited a.m. rush hour service terminates at Wakefield–241st Street in the northbound direction only. ^ A handful of rush hour trains also originate and terminate at Crown Heights–Utica Avenue, operating between the Bronx and Brooklyn. ^ Limited a.m. rush hour service to Manhattan and the Bronx originates at New Lots Avenue only. ^ "Subdivision 'A' Car Assignments: Cars Required June 24, 2018" (PDF). 61 (7). Electric Railroaders' Association. July 2018: 16. Retrieved November 8, 2018. ^ a b "5 Subway Timetable, Effective June 24, 2018" (PDF). Metropolitan Transportation Authority. Retrieved June 24, 2018. ^ "I.R.T. To Add Trains. Increases Service to Queens and the Bronx". The New York Sun. December 18, 1925. Retrieved April 11, 2019 – via Fulton History. ^ a b c d e f g h i j k l "NYCT Line by Line History". www.erictb.info. Retrieved June 9, 2016. ^ "I. R. T. EXPRESS SERVICE; Rush-Hour Schedule Started on White Plains Rd. Line". The New York Times. April 24, 1953. ISSN 0362-4331. Retrieved October 29, 2017. ^ Egan, Leo (August 7, 1953). "TRANSIT AUTHORITY TO TIDY SUBWAYS, SPEED UP SERVICE; Fare Rise to Pay for Posture Seats and New Lights in 300 Cars, Painting of Stations NEW MEMBER JOINS BOARD Mayor, Swearing Him, Assails Dewey -- Klein Praises Casey, Promises to 'Do Share' TRANSIT AUTHORITY TO TIDY SUBWAYS". The New York Times. ISSN 0362-4331. Retrieved October 29, 2017. ^ Linder, Bernard (October 1964). "Journal on the history of the 5". New York Division Bulletin. Electric Railroaders' Association. ^ "New Routes Scheduled for 2 IRT Lines in Bronx" (PDF). New York Times. March 22, 1965. Retrieved December 20, 2015. ^ "Better Subway Service for Bronx IRT Riders". Photobucket. New York City Transit Authority. April 1965. Retrieved June 9, 2016. ^ "IRT BROOKLYN RUNS REDUCED IN MIDDAY" (PDF). Retrieved September 4, 2016. ^ "The 1979 Map: A work in progress". Second Ave. Sagas. January 20, 2011. Retrieved July 10, 2016. ^ Grynbaum, Michael M. "On the Subway, V Is for Vanished". Retrieved July 10, 2016. ^ "January 1980 IRT Service Changes". New York Division Bulletin. Electric Railroaders' Association. December 1979. ^ "New IRT Schedules - Increased Service to Flatbush Avenue". New York Division Bulletin. July 1983. ^ * NYC Transit Committee Agenda September 1994. New York City Transit. September 10, 1994. pp. D.65. NYC Transit Committee Agenda September 1994. New York City Transit. September 10, 1994. pp. D.66. NYC Transit Committee Agenda September 1994. New York City Transit. September 10, 1994. pp. D.67. NYC Transit Committee Agenda September 1994. New York City Transit. September 10, 1994. pp. D.68. ^ "mta.info | Facts and Figures". web.mta.info. Retrieved June 9, 2016. ^ "Transit & Bus Committee Meeting December 2016" (PDF). mta.info. Metropolitan Transportation Authority. December 12, 2016. pp. PDF-169 to PDF-175. Archived from the original (PDF) on December 10, 2016. Retrieved December 9, 2016. ^ "Clark St Tunnel Reconstruction Weekend Service Changes". web.mta.info. Metropolitan Transportation Authority. June 8, 2017. Archived from the original on June 8, 2017. Retrieved May 9, 2018. ^ "STATION REHABILITATION Beginning 10 PM, Friday March 1 until September 2019 Eastchester-bound 5 platform at Gun Hill Rd will temporarily close". Metropolitan Transportation Authority. Archived from the original on March 4, 2019. Retrieved March 4, 2018. Wikimedia Commons has media related to 5 (New York City Subway service). "5 Subway Timetable, Effective June 24, 2018" (PDF). Metropolitan Transportation Authority. Retrieved June 24, 2018.